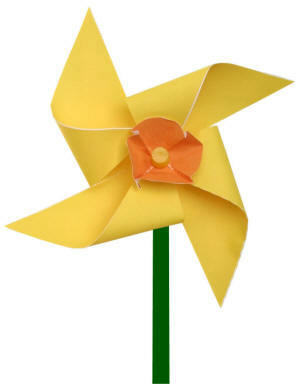 This cute daffodil craft uses the basic pinwheel with a cup on the front to form a daffodil. Fun foam ones are nice and sturdy, but you'll need to use straight pins instead of push pins to make them. Optional: paint your pencil green so it looks like the stem of a flower. Optional: you can print the B&W template on yellow paper. Take the circle and crimp it along the lines to make an orange cup shape. Fold the rectangular template piece on the dashed line to make a square decorated on both sides. Glue the square together so you have a square decorated on both sides. Cut on the diagonal dotted lines (don't cut all the way into the middle). Bend each corner to the center dot, but don't crease your folds. Place the cup in the middle of the pinwheel. Push a pin through the center into the eraser of a pencil (don't push it super tight). Optional: put a bead in between the eraser and the paper ... Some people find it spins a bit better this way... I've never noticed the difference (maybe it's the type of pencil eraser? I use fresh, unsharpened school pencils). Place it in a vase or pot and decorate your springtime table.